Reality Gives and YUWA are raising funds for a girls’ football program in the infamous Dharavi slum in Mumbai – the setting of Slumdog Millionaire. (I visited Reality’s community center and school in Dharavi last year and was impressed with their work.) 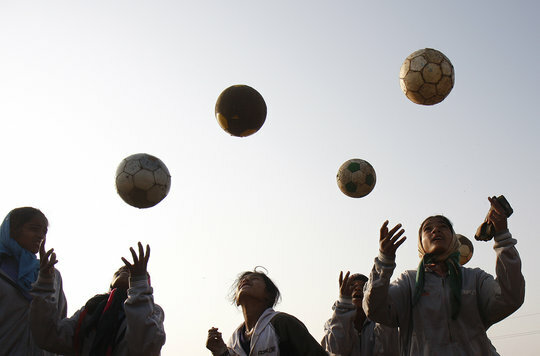 Check out this video telling the story of how soccer changed one girl’s life for the better! Entry filed under: Uncategorized. Tags: asia, be the change, developing world, development, Dharavi, Helping Women Helps the World, India, Mumbai, Reality Gives, Slumdog Millionaire, south asia, sports, video, women, women and sports, women's development, youtube, YUWA. This is great. I love seeing kids playing outside and especially love seeing girls encouraged to play sports.